Excessive fossil fuel consumption and an out-of-shape populace are two hot-button topics on peoples' minds these days. But there are some Roseville residents taking action on both issues at the same time--and they have the city behind them. With more and more of the local workforce commuting by bicycle, the city has stepped up its efforts to provide them with safe and convenient resources. Pascal Joly makes the 8-mile round trip commute from his downtown Roseville home to Hewlett-Packard just about every workday of the year. "I am more apt to drive to work because of the heat instead of the rain," said Joly, who grew up in France and sees the challenge Roseville faces in becoming a bicycle friendly city. An avid participant in BikingRoseville, Joly realizes that transforming a car-based culture such as ours does not happen overnight. It's more like riding a bicycle uphill in high gear. It doesn't happen fast. With city hall behind you, though, at least people aren't pedaling backwards. 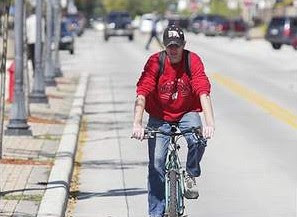 "Lots of people think of biking as an off the street activity," said (David Allen, of BikingRoseville). "I see it as a means of transportation, not just recreation. It's great exercise and it's easy on the wallet, but it's also a great way to get around." It’s just another day at the office for Dominique Mohrman as she packs up the streamlined trailer attached to the back of her touring bike and rides down U.S. Highway 6. In the morning and evenings, when most people are getting in their cars to go to and from work, some valley residents like Mohrman would rather make the work commute by bike. Most days when the weather permits, Mohrman and her husband, Jeff, ride from their home in Avon to Eagle-Vail, where the couple runs Colorado Bike Service. Five--five!--gallons of water? 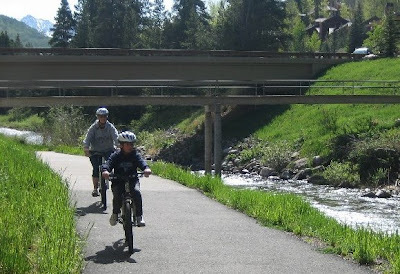 This favorable article features insights and observations from several Vail-area bicycle commuters, and includes a list of helpful tips. Jim Sobczak rides his bike everywhere in Sheboygan. "I enjoy riding," Sobczak said. "You see more when you ride." But one thing Sobczak has noticed is that riding in the city can be a dangerous experience. The program--won through the advocacy efforts of Bikes Belong and the League of American Bicyclists among others--provides $25 million per year through 2009 to be used for programs and facilities that promote a transportation change from driving to walking or bicycling in these four pilot communities. In a sense, these areas become laboratories for bicycling and walking, similar to what Denmark has done with the city of Odense. Again, another example that advocacy works for bicyclists. Still, there’s plenty of work to be done to improve safety for bicyclists on the street and the highway. It’s a pollution-free form of travel that helps the users save money and improve their physical health. Every time someone chooses to ride a bike instead of driving, we all benefit a bit. So slow down and respect bicyclers on the road. Let’s look for ways to improve riding conditions on the pavement. Favorable commentary from a driver's perspective by a writer in Kansas City, which has the lowest rate of bicycle commuting among the largest metropolitan areas in the U.S. Image: HolisticGeek. 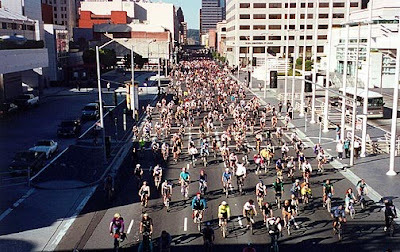 Critical Mass in San Francisco, gaining respect for bicyclists since 1992. The 15th Anniversary ride is Friday, September 28. Potholes, narrow roads, mean drivers. Riding a bicycle in Boston is something akin to combat. Cyclists routinely rank the city America's worst. In the next several years, Menino said, he plans to create a network of bike lanes on roads such as Massachusetts Avenue and Commonwealth Avenue in the Back Bay and the Fenway. "We need to get more people to take the bike around. It's good for their health, it's good for the environment, and there's less congestion on our streets," Menino said. "It's time for this issue to come to the forefront." You know that bicycling is truly on the ascendant in the U.S. when you see Boston embracing pedaling commuters. The article indicates that Menino is also looking favorably at adopting a bike-sharing system similar to Paris' wildly successful Vélib. Despite the occasional retrograde remark by the federal transportation secretary, bicycling really is emerging as an effective urban transportation mode. The richest fifth of the population cycle on average 2.5 times as far in a year as the poorest fifth. The Department for Transport’s National Travel Survey indicates that the poorest fifth, despite being five times less likely to have access to a car, are very unlikely to consider cycling as a solution to their transport needs. The London Cycling Campaign said that people on higher incomes tended to be better educated about the health benefits of cycling and more concerned with maintaining a healthy lifestyle. Studies have shown that regular cyclists typically enjoy a level of fitness equivalent to someone 10 years younger, and those cycling regularly beyond their mid-thirties add two years to their life expectancy. 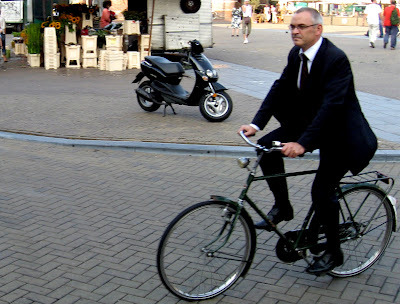 Cycling groups believe that a lack of education and negative stereotyping of cyclists are the main reasons why poorer people appear unwilling to hop on bikes. I suspect that most readers of this blog are bicycle commuters by choice, not economic necessity. The observations suggested in this article from London are likely equally true in the U.S.: that lower-income workers are more concerned with the immediate personal needs of making a living than with the longer term social hazards of global climate change. The perceived "status" of driving is also a likely discouragement to low status workers. Car makers strive to create a perception of automobiles as more than a mere transportation vehicle, but as a means of personal empowerment. Sometimes when he pushing uphill against a harsh winter breeze, David Darcy wonders just what he's doing riding his bicycle to work. But even when the north winds howl or the rain pelts his back and legs, Darcy reminds himself how much money he's saving riding his bike 30 miles to work and back four days a week, how much exercise he’s getting in, how much tension he’s releasing, and how much he just hates traffic. (Darcy is one) of the many Tulsans who choose to commute by bike on a regular basis. 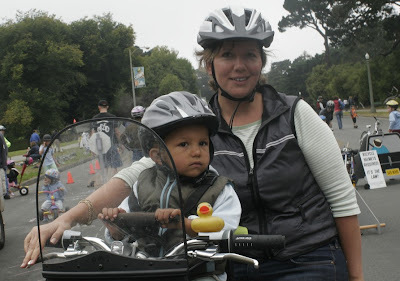 About 40 participate in the Indian Nations Council of Governments Bike 2 Work program (www.green-traveler.org), which seeks to raise awareness of cycling as legitimate transportation. As it prepares to wrap its second year of tracking bike commuter miles, INCOG bicycle pedestrian planner Patrick Fox said Tulsa workers logged more than 8,500 miles in 2007 despite an especially wet year, up 11 percent from 7,602 last year. Officials estimate this cut carbon monoxide emissions by 870.4 pounds. A favorable article from Oklahoma, featuring several interviews with local cyclists and several helpful suggestions for would-be bike commuters. Thousands of car-crazy Parisians upbraided their mayor when he announced a plan to take away car lanes and replace them with space for bicycles. 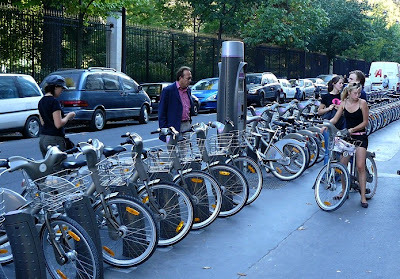 Now the City of Light has bought 10,000 new "public" bicycles, with an eye to about 16,500 more by the end of 2007, and many of the same people who vilified the mayor are riding the bikes instead. Parisians' embrace of the Vélib program has attracted much attention, including recent reports on National Public Radio, the BBC, the Chicago Tribune, numerous blogs, and other international media outlets. In only its first two months, Vélib has attracted more than 53,000 members, increased its fleet of bikes by 40 percent (to 14,000), and seen more than 3.7 million rides. By any measure, a success. On the day the Texas Transportation Institute released its annual Urban Mobility Report on U.S. traffic congestion--summed up in one word: worse--this supportive editorial from Pennsylvania rightly asks, Why not here? Image: Web capture. Vélib station near Jardin du Luxembourg. Pity our powerful political leaders as they grapple with the complex solutions to global warming. 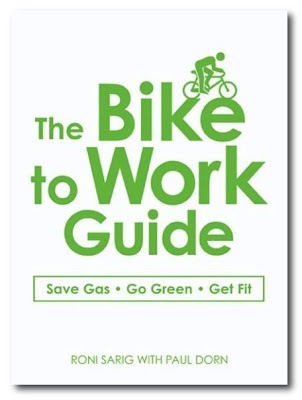 They are so burdened by the task of reducing massive greenhouse gas emissions--such as those from our transportation sector--and so preoccupied by the cost of action, they probably don't even notice the cyclists they pass (or who pass them) on their way to work each day. Getting people and goods from A to B accounts for about 50 per cent of all Canadian greenhouse gas emissions when activities like car-making, road-building and fuel production are added to tailpipe emissions. Each litre of gasoline burned to operate a motor vehicle produces 2.5 kilograms of greenhouse gases. Emissions from operating a bicycle, on the other hand, are zero. The issues and obstacles associated with bikes are simple – quite unlike the solutions that generally occupy our leaders, including the illusory promise of GM's electric car (100 years after the first ones were produced); pricey hybrids (often shipped 10,000 kilometres from Japan); or the timeline for the start of the hydrogen revolution (itself dependent on a massive increase in renewable power). Great op-ed by a Canadian environmental attorney, who makes the relevant point that Toronto is no colder than Copenhagen, where 30 per cent of citizens commute by bike. As the city ponders the creation of a 1,500-bike rental fleet, a Tribune reporter and photographer pedaled out last week on the Near North Side and in the Loop with two Chicagoland Bicycle Federation employees to get a firsthand look at the joys and dangers of urban cycling. Mayor Richard Daley, the great champion of bicycles, wants to launch a new fleet of as many as 1,500 rental bikes in Chicago. Based on programs in the French cities of Paris and Lyon, the bicycles would be available to pick up and drop off at locations around the city, available to subscribers at a minimal cost. Anxious reporter ventures out on a bike, with mixed results. The article makes much of the dangers, and makes little of the joy. This feature includes a video with commentary by the inimitable velo visionary Randy Neufeld. 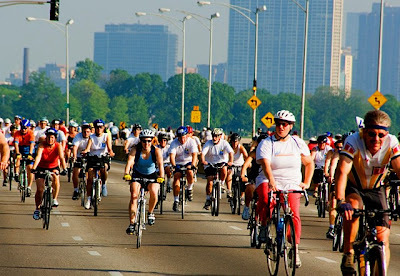 How could it not be good to have 1,500 more bicyclists on the city's streets? Daily letters from "insulted," "offended," "shocked" and "outraged" readers are printed in the P-I. A few of those grouchy letters have been mine. Nearly all my complaints dealt with one topic: bicycling. Oh, don't I love this kind of reactionary nonsense. As many contributers to the SFBIKE listserve have illustrated in the past, replace every reference to "bicyclists" or "bikers" with some traditionally marginalized group (pedestrians, African Americans, gays, women, immigrants) and you'll recognize the real hate expressed here. "I have no problem with [oppressed group]...but the [oppressed group's] extremists are simply going too far..."
What the author is really saying is that the (auto-dominated) status quo suits him fine, and any push for reasonable change is objectionable. He is offended by, um, well, politics. If we simply ride our bikes quietly, no problem. When we organize to express grievances and demand improvements, then big problem. Cyclists should expect and demand safe accommodation on our public roads, just as does every other user. Nothing more is expected. Nothing less is acceptable. 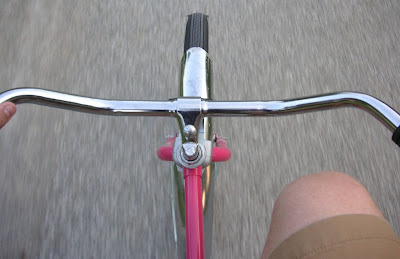 The odds of dying from a bicycle crash are one in 71. This compares to one in 75 for a light truck (pickup truck, SUV, van), one in 108 for a car, one in 43 for a truck, one in 26 for a motorcycle, and one in 15 for a pedestrian. In other words, the odds of dying in a bike crash are about the same as the odds of dying in an SUV crash. The false sense of security that comes from an SUV tends to produce far more dangerous driving behaviour. It also obscures the fact that an individual cyclist's choices strongly influence their risk of fatality. Cyclists are not helpless victims of safety statistics (even encouraging statistics). It might not be politically expedient to state, but in the majority of bicycle crashes, the cyclist is at least partly at fault. Cyclists are hit when they ride on the sidewalk and appear out of nowhere at intersections; when they pass on the right; when they ride at night without lights and reflectors; when they ride the wrong way down one way streets; when they ride too closly to parked cars; and so on. Bike infrastructure can certainly help: streets with clearly marked, well-maintained bike lanes are safer than streets without them. It's also clear that bike lanes increase the perception of safety for would-be cyclists. This commentary from Canada is a very effective summary of the risks of bicycling, in terms of hours spent cycling, distance traveled, commute mode, and life expectancy. In essence, it argues that responsible cyclists can effectively minimize their risks and avoid injury. And enjoy many happy, healthy miles on a bike. Suppose you fall asleep and don't wake up for 20 years. When you finally snap out of your slumber, Time Magazine has done a cover story titled, "Boulder: America's Best Bicycle City." What would the article look like? That was the hypothetical scenario posed to more than 100 of Boulder County's influential bike- and recreation-oriented people Friday. The city's Go Boulder transit program brought them together for the Boulder Bike Summit, a discussion about what could make Boulder a better place for bikes in the next 20 years. The city is already nationally known as a bike-friendly town, but those gathered for the summit at the Outlook Hotel wanted to make it even friendlier. Boulder, Colorado, is already a visionary city for bicycling, earning a Gold level award from the League of American Bicyclists' Bicycle Friendly Communities program. And the city isn't resting on its laurels. 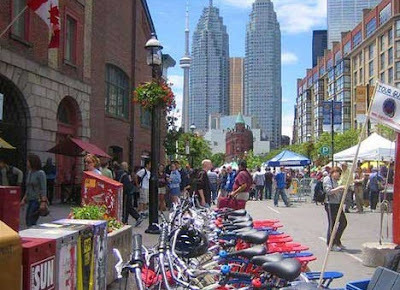 Topics at the summit mentioned in this article included car-free streets, bike service stations, education initiatives, better transit integration, additional trail development, and more recreational and sport cycling promotion. Creating a vision, and continually pushing the envelope, is an important component of any advocacy effort. I have to wonder if a similar summit might help cities like Davis, California, which appears to have stagnated in recent years in terms of bicycling innovation. Perhaps a prod to such envisioning might come from this week's Walk Bike California conference in Davis. Image: Web capture. Downtown Boulder bike facilities. Pittsburgh: Becoming a City of Bicycles? On the go: Is the City of Bridges becoming a City of Bicycles? Local officials will cut a ceremonial ribbon on a renovated bridge over the Monongahela River within the next two months, but unless you walk, jog or ride a bicycle, it's not for you. 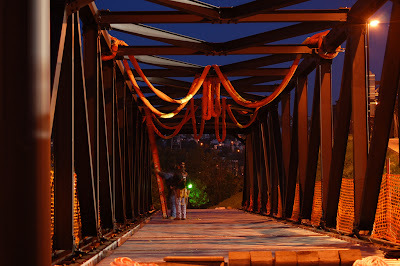 Soon, when weather is suitable for bicycle travel, cars will be backed up end-to-end on the vehicular Hot Metal bridge at rush hours while office workers, students, physical enthusiasts and recreational riders whiz past on the rails-to-trails Hot Metal bridge. The new Hot Metal bridge could prove to be the biggest catalyst yet for a largely overlooked, two-wheeled transportation mode that has come out of the closet and is rapidly blossoming in popularity. It will be a traffic-free link not only to and from Downtown but Oakland as well, via Panther Hollow. 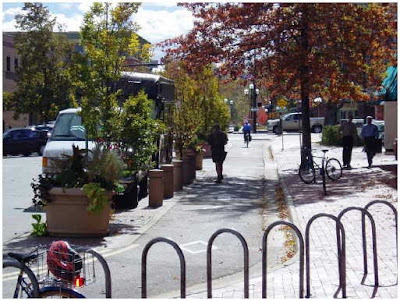 This article includes more details of Pittsburgh's initiatives for bicycling, which include bike racks at downtown parking facilities, bikes on transit, and development of bike lanes and trails. Things look encouraging there. Image: Web capture. Hot Metal bike-ped bridge under construction in Pittsburgh. Visit: Hot Metal span gets new life as link for trails, Pittsburgh Post-Gazette, 05.15.06. High gas prices have sucked cash out of our pockets for months. 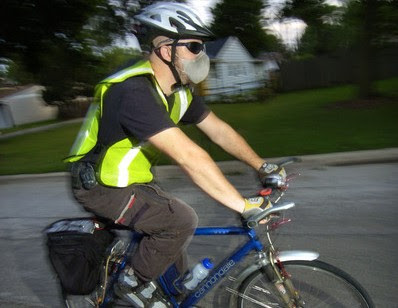 Nick Lenarz takes a stand every day when he hops on his bike in Rolling Meadows and pedals 15 miles to his job in Northbrook. On a good day, he sees other cyclists on the road, reminding him he's not alone in his quest to be healthier, support the environment and save a ton of gas money. Then there are the not-so-good days. He's had encounters with anti-bikers, occasionally ending with an object thrown at him: an apple, garbage, an open beer can. This otherwise very favorable article, which includes a helpful list of bike-commuting how-tos, begins with this provocative anecdote. Which raises something I've always wondered about: Why are some motorists so hostile to bicyclists? Is this hostility going to get them to their destination any faster? Would more drivers and fewer bicyclists improve their travel times? And I also wonder about this cyclist, Nick Lenarz, pictured above. Doesn't this seem like protective overkill? A helmet, reflective vest, and air mask? Are conditions in the greater Chicago suburbs really that bad? Image: Daily Herald. Chicago-area bike commuter Nick Lenarz. I have a dear friend in South Florida whom I used to describe as the most anti-walking and anti-bicycling demographic imaginable. He drove a large SUV occupied by only him, thought anyone who rode their bike was a "treehugger" and always scoffed at the thought of riding a bicycle or allowing his daughters to ride their bikes beyond the walls of his private upscale community. 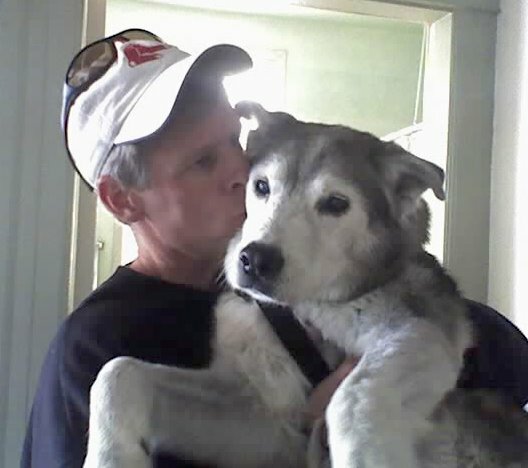 For years I begged him to join me on one of my many cycling adventures throughout the country and world, but to no avail. 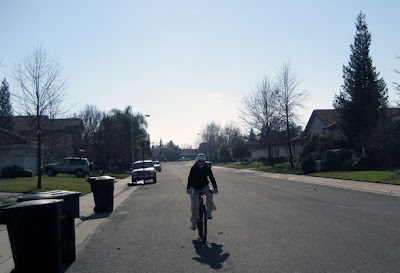 However, the most amazing breakthrough has occurred during the last two years that I still can't believe: His cuter-than-a-button daughter now has him riding his bike with her to and from school that is located well outside his subdivision. I spoke with him on the phone a few days ago as he was getting ready to leave his house to meet his daughter for their ride home from school and he mentioned it was about to rain. "Why don't you just drive to school and put her bike into the back of your vehicle?" I asked. His response left me stunned. "Are you kidding me?" he replied. "Marisa would be crushed if she couldn't make the return home on her second day of school." Here, my macho, 6-foot-plus, tough-guy, SUV-driving friend was reduced to riding his bike home in the rain because he didn't want to let his young daughter down, and rightly so. In addition to this encouraging account of personal transformation, this article by the state director of the Rails to Trails Conservancy includes an enthusiastic endorsement of the Florida Department of Transportation's "Conserve By Bicycle" initiative, which is studying how to encourage more bicycle use and reduce bike and pedestrian fatalities.